Test for keg leaks. 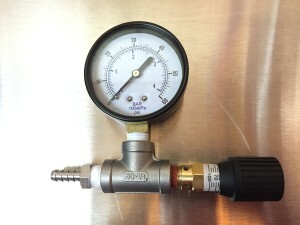 Pressurize your keg to serving pressure. 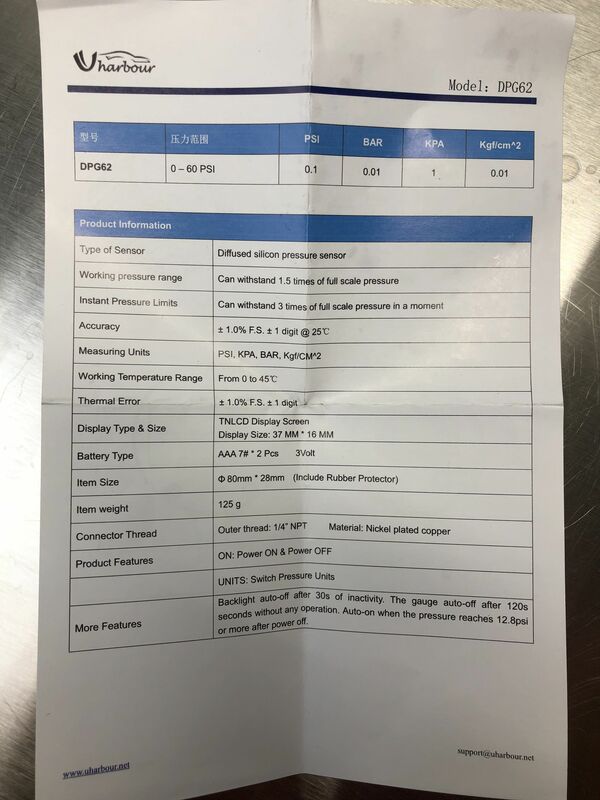 Put the Spunding Valve on (with the pressure set well above your serving PSI) and note the reading. The gauge should remain steady. If pressure drops, you know you have a keg leak. 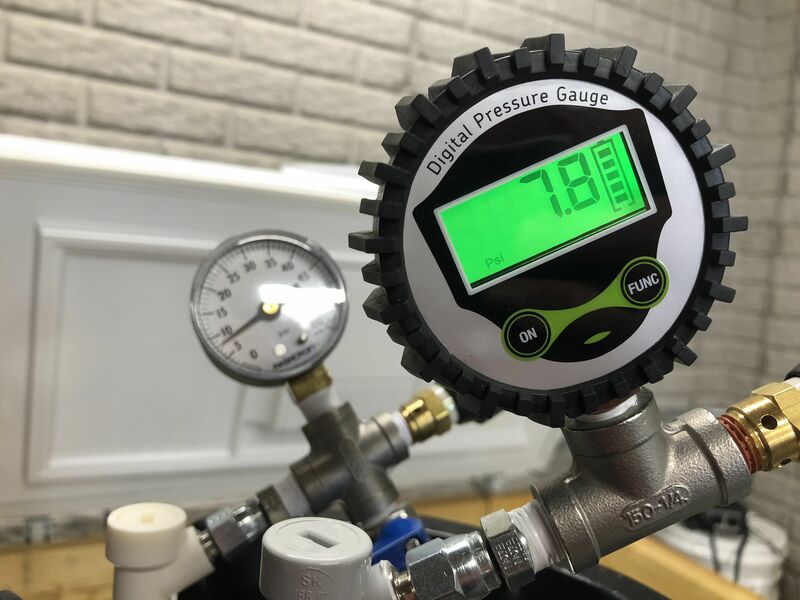 The digital build, see below, is especially helpful for this task, The digital gauge reads with .1 PSI resolution making pressure changes easy to spot. It’s worth noting that this checks the entire keg including gas body o-ring. That spot is hard to check and other way as it’s only in function when the gas QD is on. 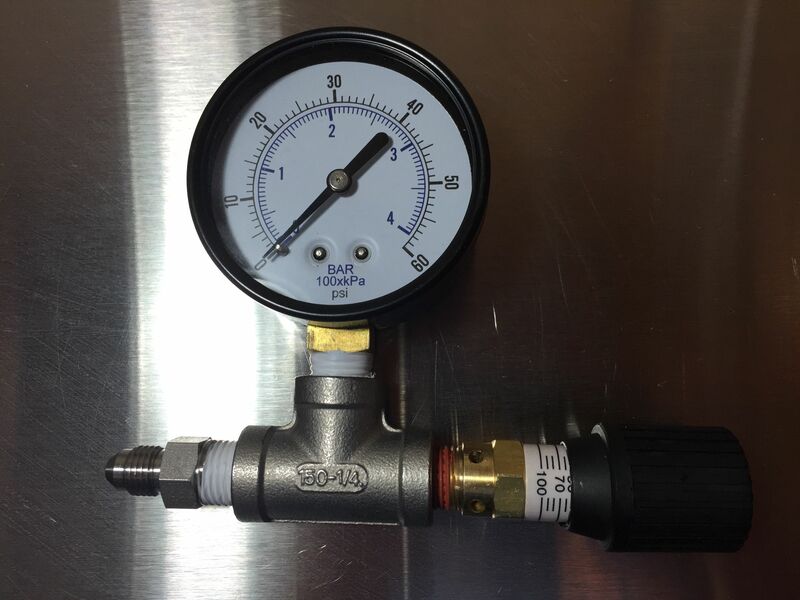 When the gas QD is on… it’s difficult to spray and check for bubbles underneath the gas QD. Thanks to Scott Janish for this tip! This is a 2.5 gallon batch of beer that I fermented and naturally carbonated all in a 5 gallon keg. 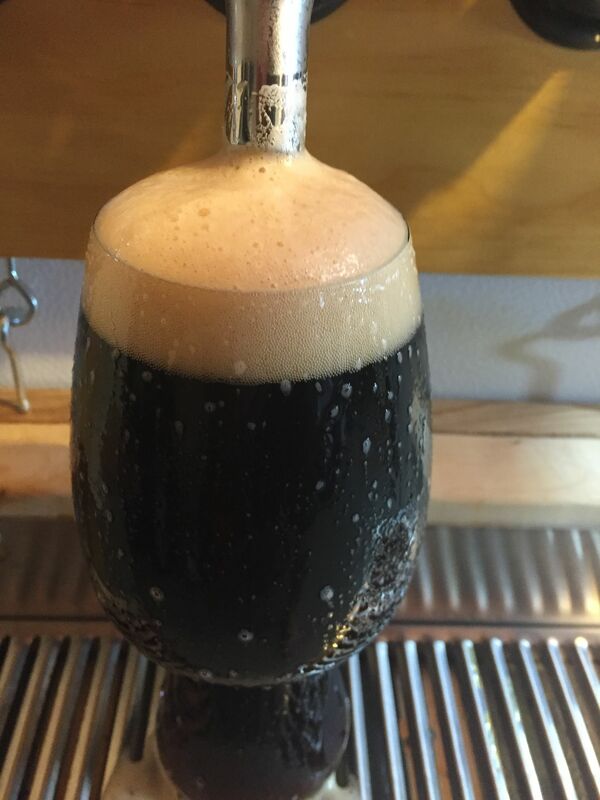 This is a carbonated beer that I poured immediately after it was transferred into a serving keg. 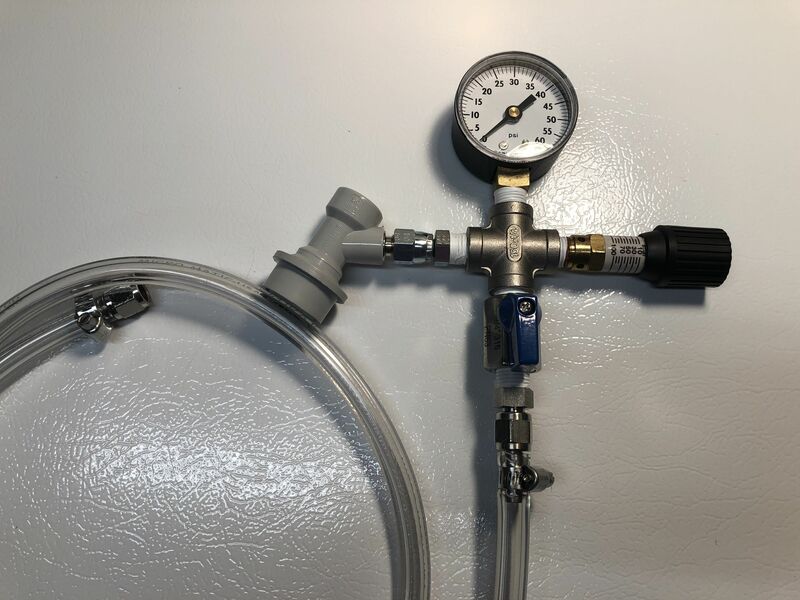 Carbonation directly in your keg allows you to naturally carbonate your beer (saving CO2 and $) while maintaining reasonably tight control on carbonation levels. This could be done by adding priming sugar, capping fermentation prior to the completion of fermentation or more traditional krausening (adding wort back to the fermenter) methods. Determine your desired pressure based on temperature and desired carbonation using a carbonation chart. See: Balancing Your Draft System for a carbonation chart. 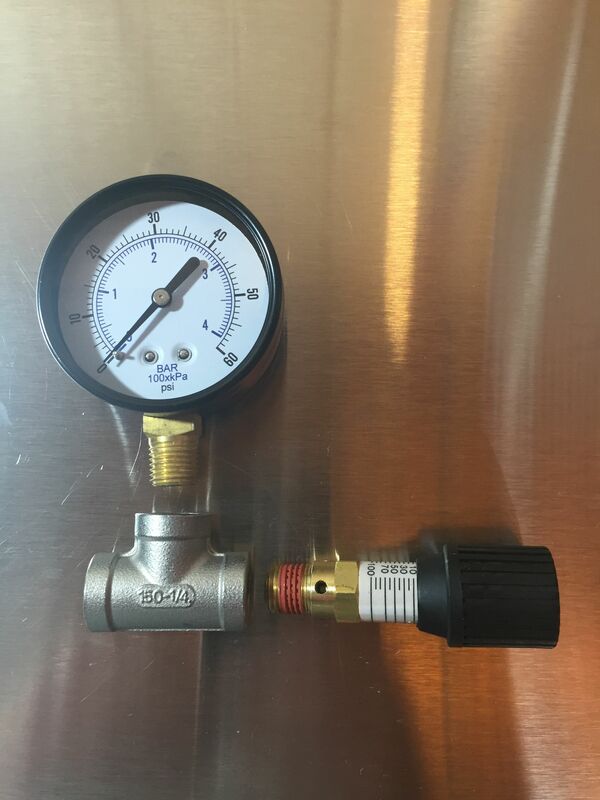 Pressurize the keg to just over your desired final pressure. Wait. As the remaining simple sugars are fermented, carbonation occurs and excess CO2 will be expelled from the spunding valve giving you just the right amount of carbonation. I give it a couple days after reaching target pressure. If you’re less sure how much fermentable sugar remained, I would suggest giving it a few days longer. 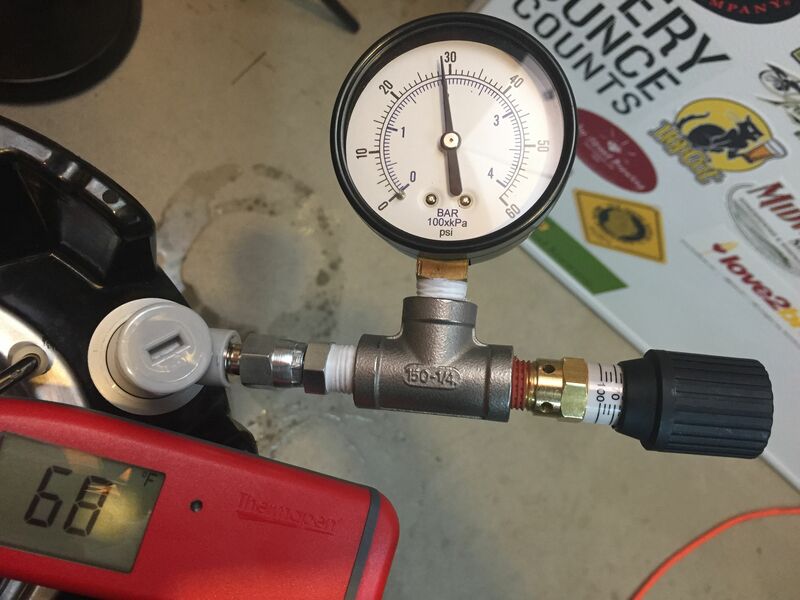 Chill your keg, allowing your beer to absorb head space CO2 and reach equilibrium. Use the same general process as for carbonation (skipping the addition of fermentable sugar). 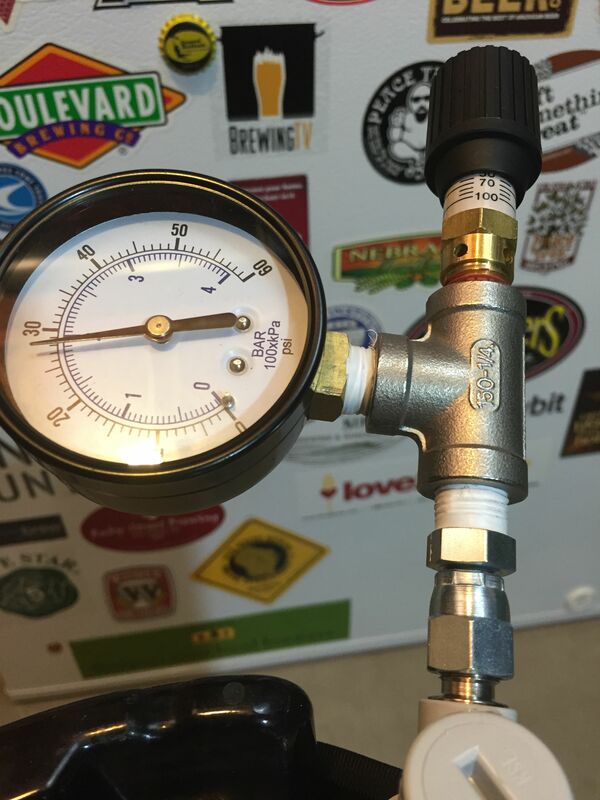 Use a carbonation chart to determine proper pressure for the temperature the keg is at. See: Balancing Your Draft System for a carbonation chart. 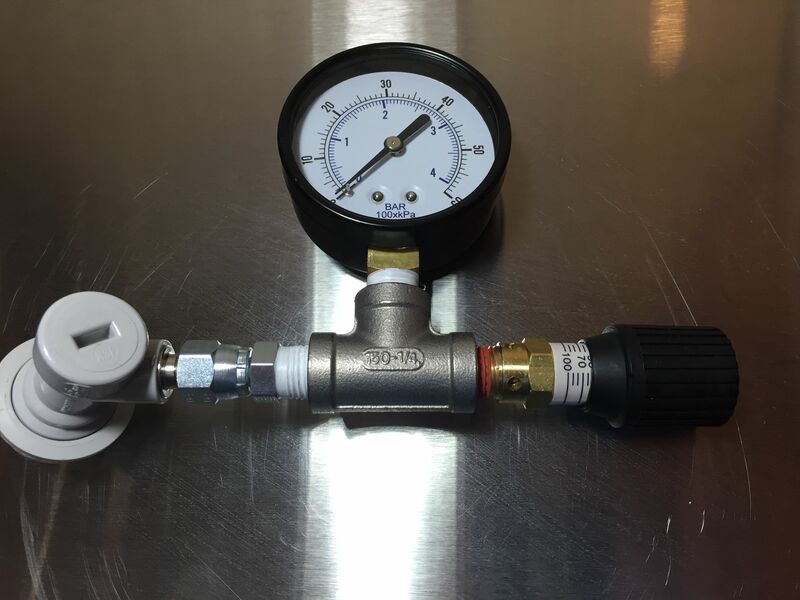 The Spunding Valve allows excess pressure to vent until the new carbonation level is achieved. You can agitate the keg to fix carbonation more quickly. Important Note: Product pages may display other size variations of the fittings used here. If a particular size is out of stock, sometimes suppliers link to another size. All thread sizes for this build, both NPT and flare, are 1/4″. If you want to replicate this build, pay special attention to the fitting sizes that are used and double check to make sure you’re purchasing the correct size fittings. Because availability of fittings can be an issue, when available, I’ve linked to multiple options and vendors for each build type. This valve [Control Devices CR Series Brass Pressure Relief Valve, 0-100 psi Adjustable Pressure Range, 1/4″ Male NPT] is the heart of this Spunding Valve build. It is essentially a manually adjustable pressure relief valve. This one is adjustable from 0 to 100 PSI. There is no homebrewing-related situation I’m aware of that would have you at 100 PSI. Generally you’d be at or below 30 PSI. 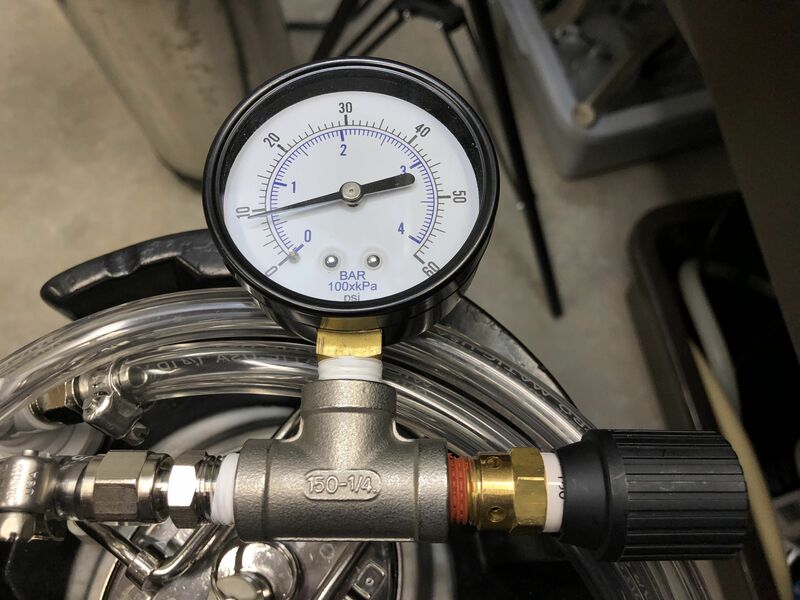 As always, you’ll want to ensure that all components in your system (kegs, tubing, etc) are rated for your desired pressure. Also, always read and follow manufacturer’s instructions and guidelines. This build constitutes the second version of this valve for me. My first build had a 30 PSI gauge. That’s good for almost every situation. With this update I wanted the ability to go to a little higher pressure if needed. I used a Zenport DPG60 Gauge. It reads 0 to 60 PSI. 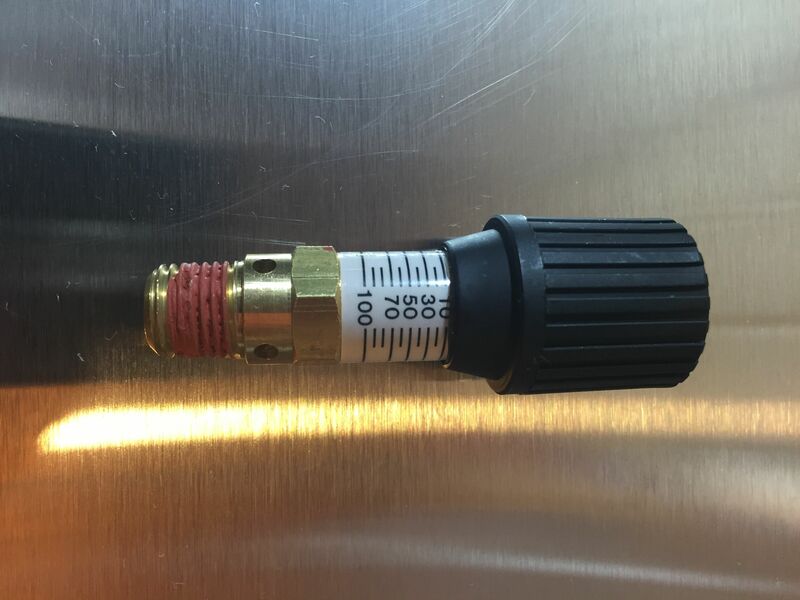 This stainless 1/4″ tee fitting connects the relief valve, pressure gauge and a final connection fitting together. Practically speaking any properly rated 1/4″ NPT threaded tee fitting should work. The tee fitting, gauge and valve together. The gauge required valve sealant tape, the relief valve came with some sort of thread sealant. The only thing that remains is choosing how the assembly will connect to your serving or fermenting keg. These are grouped into general connection styles. Some styles have similar fittings that accomplish the same thing. Additional fitting options for each build can be found in the complete parts list toward the end of this post. When I’ve tried a fitting, I’ve included a photo. Style 1: FFL (Female Flare) connection ready to connect to a pin or ball lock QD. 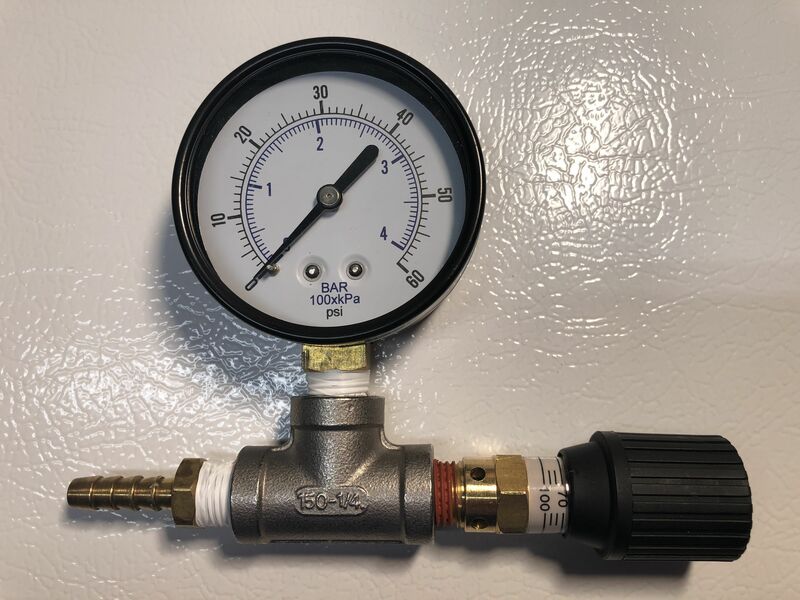 This version consists of Gas ball lock QD (it could just as well be a pin lock QD) – this fitting [1/4″ NPT Male x 1/4″ JIC Size] (* sizing note) – Stainless Tee – pressure gauge and this valve [Control Devices CR Series Brass Pressure Relief Valve, 0-100 psi Adjustable Pressure Range, 1/4″ Male NPT]. Valve Sealant tape goes on the first fitting and the pressure gauge. Style 2 [as of the most recent update to this post, this fitting is not available in the size I used for this build, pay close attention to the note about thread size that follows]: MFL (Male Flare) connection ready to connect to a flare 1/4″ swivel nut. 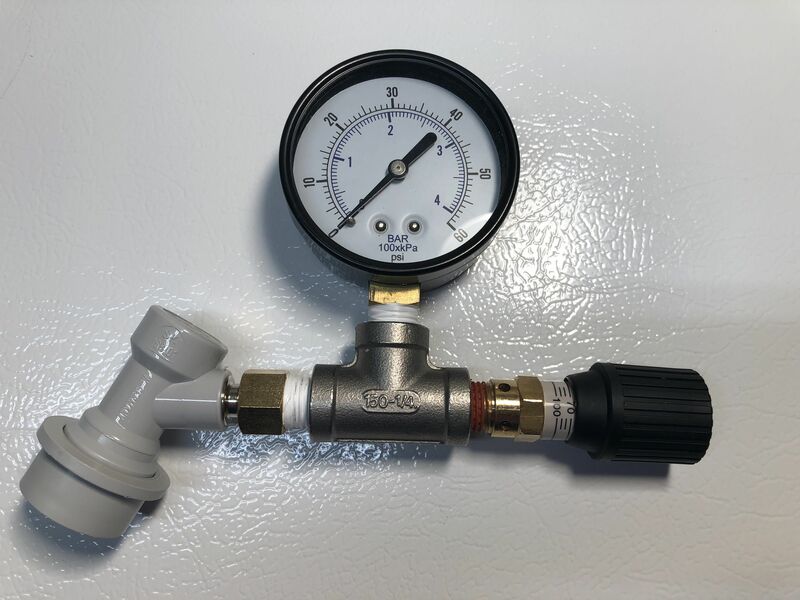 This version consists of this fitting [1/4″ NPT Male x 1/4″ JIC Male] – linking to incorrect size as of this update (* sizing note) – Stainless Tee – pressure gauge and this valve [Control Devices CR Series Brass Pressure Relief Valve, 0-100 psi Adjustable Pressure Range, 1/4″ Male NPT]. Valve Sealant tape goes on the first fitting and the pressure gauge. The 1/4″ MFL can connects to 1/4″ FFL female flare of your choice. This version is nice if you’re tight on space. You can coil it up on top of a keg or set it off to the side. Style 3: 1/4″ barb – Ready for whatever 1/4″ ID tubing you’d like to use. 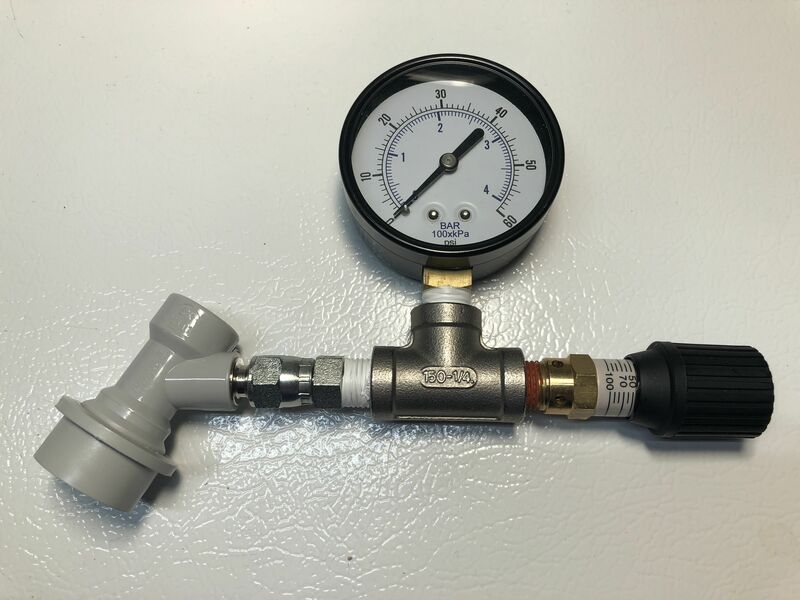 This version consists of this fitting [1/4″ Hose Barb 1/4″ Male NPT] (* sizing note) – Stainless Tee – pressure gauge and this valve [Control Devices CR Series Brass Pressure Relief Valve, 0-100 psi Adjustable Pressure Range, 1/4″ Male NPT]. Valve Sealant tape goes on the first fitting and the pressure gauge. Style 4 : This build uses a cross fitting instead of tee fitting. The additional leg has a ball valve [1/4″ Stainless Steel (316) Mini Ball Valve – FxM NPT] on it. My thinking on this was to give you the option to use one Spunding Valve on multiple kegs. This could be for any of the functions mentioned above. Pick the connectors you want for your intended purpose. One idea – ferment one beer under pressure and use that pressure to force carbonate another beer to save CO2. Making a digital Spunding Valve is as simple as using a digital gauge. I tried a couple different digital gauges and settled on this one – pictured in the assembly above. The other gauge I tried was much more expensive and didn’t really work well. It drifted wildly. This was a reasonable price and has given me accurate and consistent readings. 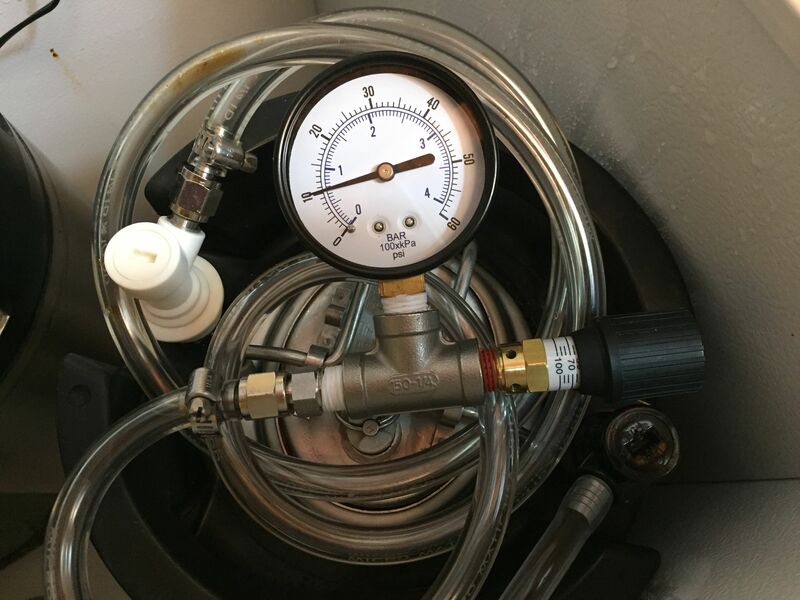 This photo shows two gauges hooked up to the same keg – agreeing on PSI. The really nice thing about this digital gauge is the .1 PSI resolution. That’s really handy if you’re using the gauge to try and find leaks. It allows you to see pressure changes more quickly. 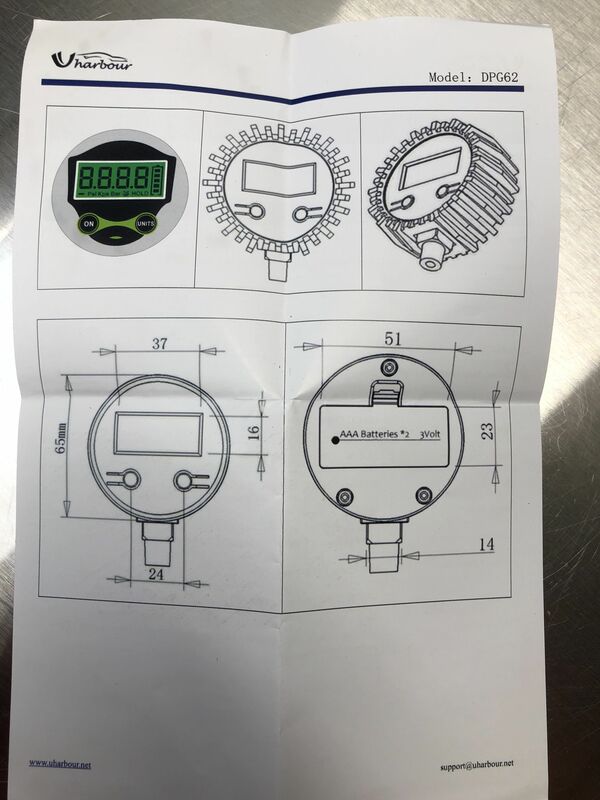 My gauge came with this user manual/specifications sheet – front | back. One quick tip… the threads aren’t super long. The first time I put this digital Spunding Valve together, I noticed the pressure dropping, again… the .1 PSI resolution is handy for spotting just this issue! Anyway, I didn’t have the gauge quite tight enough and it was showing a slow leak. Easy fix, I took the gauge off, put a couple extra wraps of teflon tape around it and tightened it a little more. Whammo! Check for leaks. If you’re using a version that has a QD installed in some form or fashion, you can pressurize it on a keg and then take it off. There will be a small drop when you take it off, but the pressure should remain steady after that. If it’s going down, make sure everything is tight. If you don’t have a QD… spray with Star San or soapy water until you are leak free. When setting desired pressure… start high and work your way down. As the valve gets close to where it is going to eventually settle, it slows down the release of gas. Working your way slowly down, helps you hit your desired pressure without passing it (going too low). Here I’m dialing in my desired pressure. Also pictured: Thermapen Mk4 [Review]. Generally speaking, the brass variations of these fittings are probably going to be the most economical route to go. This is a general statement and may not always be the case. Check product pages for current prices and availability. Search: As mentioned previously, availability of fittings in the proper sizes can be an issue. This has proven especially true for the keg fitting options piece. The two thread types for that piece in this build are 1/4″ npt and 1/4″ SAE JIC. This Amazon Search may be helpful in finding compatible fittings for the build you’d like to complete. Note: that search may very well return fittings that are not helpful for this project. Pay attention to thread size, material and fitting gender. If you find a great fitting that isn’t listed here, Submit a Tip and let us know about it. Brew Hardware Fittings – similar, but not identical to what I used for the builds found in this post. Product pages may display other size variations of the fittings used here. If a particular size is out of stock, sometimes suppliers link to another size. All thread sizes for this build, both NPT and flare, are 1/4″. If you want to replicate this build, pay special attention to the fitting sizes that are used and double check to make sure you’re purchasing the correct size fittings. This entry was posted in Carbonation, Fermentation, Homebrew Hacks, ig, Projects, Reviews & Top Posts, Spunding Valve, Top Posts on February 22, 2011 by admin. Hey, so I am just having issues with this idea. 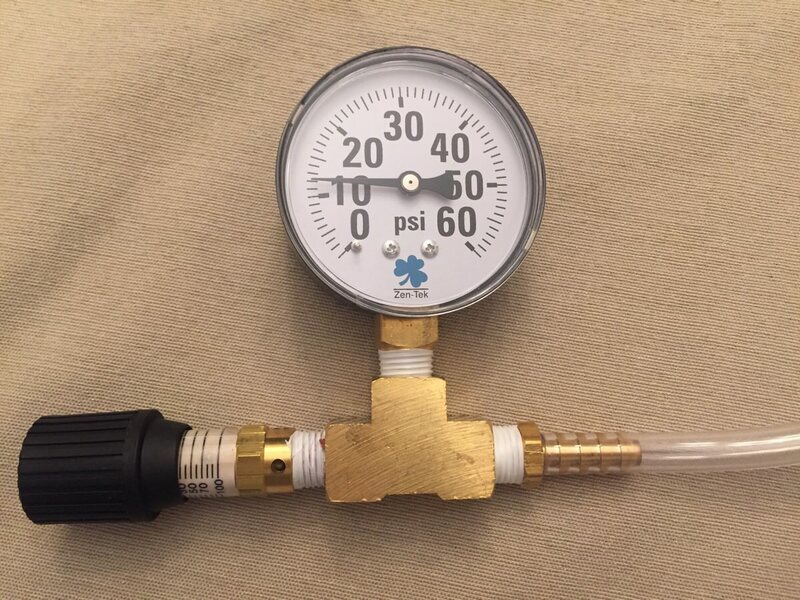 I have my beers kegged, get my priming sugar water ready based on temp and psi using the chart, add it into the beer, seal it up and put on the spunding valve and never see the beer do anything. No PSI movement and doesnt even seem to carbonate. I know there is yeast in the beer so it must be a loose seal or something. idk. my third different keg/beer and the same results. I feel like its just easier ot throw it on C02 and let it carbonate it for me instead. Hey Nate! A couple things – I’d make sure you’re getting a complete seal on keg. Like 10 PSI. Other than that, we’re still talking fermentation here, so make sure the kegs are in a spot that’s warm enough. If neither one of those fix the issue then I would search for a leak either in the spunding valve or the keg. When fermenting under pressure, wouldn’t the spunding valve act as a blow off as the gas is released, damaging it? Not sure I understand what you’re saying. The adjustable PRV vents pressure in excess of the set point. Yes, I wasn’t very clear. I’m not worried about the gas doing the damage, but the krausen (?) would cause problems, wouldn’t it? Gotcha, Yes krausen could be an issue. I think that pressure fermentations have less krausen in general, but you would want to make sure there’s enough head space so krausen doesn’t come out the spunding valve. Another comment on here details a method to clean the valve. I haven’t tried that out, but I think the best thing to do make sure you have appropriate head space so this doesn’t happen. I am pretty sure it depends on how you do it. From what I have been told, you want to transfer it into your final keg with around 4 points left which should be enough fermentation left with the yeast to create around 2.4 volumes of c02 and shouldn’t mess with the spunding valve as long as you are leaving normal head space in the keg. Granted this is purely natural carbonation using the yeast to create and carbonate the beer for you. No adding in priming sugar or anything. More or less the way that German breweries will do it along with doing LODO as far as brewing. I havent done this method yet but plan on doing it my next batch if I can get everything done in time. This guy is going from finished wort to fully naturally carbonated lager beers in 7 days. 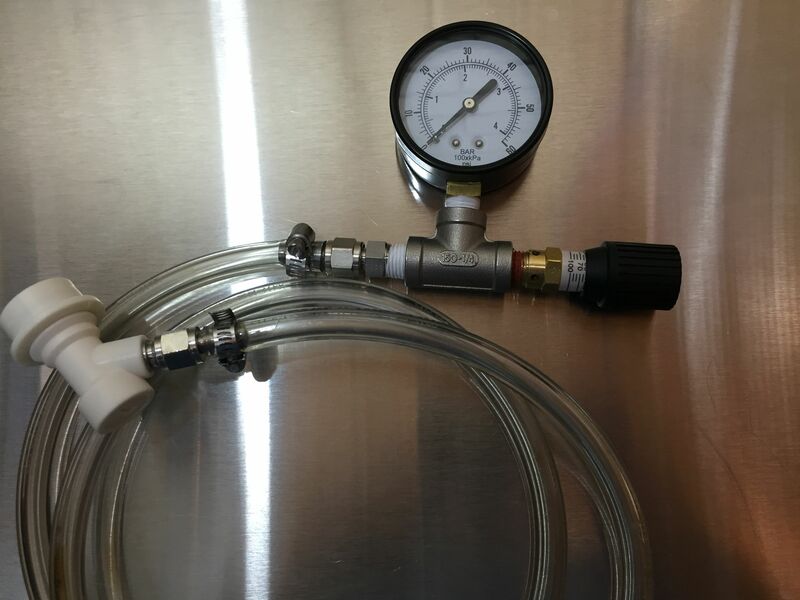 If you are using Option 1 to transfer beer to a keg and you overfill the keg, what prevents beer from coming out the spunding valve and worse into the pressure gauge. Can the spunding valve be cleaned and sanitized easily? Seems like Option 2 with the hose might have an advantage for this purpose. Great question! The answer is… nothing. You’d want to be careful not to do that. You could clean out most of the fittings, but probably not the gauge and maybe not the adjustable pressure relief valve. You’re right that option 2 would have an advantage in this regard as you’d be able to see the beer coming. Actually, there is a way to clean the valve! Fill a clean keg with a gallon of distilled water, pressurize it through the gas line, then hook up the spunding valve to the liquid line. Dial the valve down to zero and water will shoot out, so you might want to do this in a bathroom/outside. Let the gallon of distilled water run through, and then run co2 through the valve to dry it. Cheers. With Option 1, I was losing approximately 1 PSI per day, until I forced teflon tape into the swivel joint of the 1/4″ NPT Male x 1/4″ JIC Female fitting. Now it’s holding steady. Thanks for adding the alternative source/parts. Know of any other sources to buy this piece? I would prefer to stick with the smaller footprint of “option 1”. Thanks! Hey Jake. Those links go to the general part page and then you select your size from there. I’ve tried to note that throughout the post. There have been availability problems for a while. I’m looking for alternate sources/parts but haven’t come up with anything yet. Hi, amazing article thank you. I really need this, one very important question tho. If I set my desired pressure to 20 psi, when the tank reaches more than 20psi it will open and release pressure. Does it close again at 20psi to maintain that desired pressure? Or does it just release all the pressure in the tank so you have to start building pressure again from zero? The valve is open if pressure is over 20 psi and closed if under 20. So it will build up to 20 and then maintain it. For clarification, I don’t believe that you can reliably determine pressure using any of the markings on the adjustable PRV valve. The gauge, in my opinion, is a necessary component. I purchased the valve and have a question when using. The markings for the valve readings aren’t very accurate. The gauge reads 10 psi for example and the valve is set to almost 30 to keep the gauge stable at 10 psi. Is this your experience? No, that’s not my experience. The gauge reads a couple PSI off of what my regulator says, but I’m not sure if it’s wrong or if the regulator is wrong. In any case, they are close. I notice the same issue. It is off by quite a bit — goo thing the gauge is on there! Great idea to have the Schraeder valve on there as well. You could use a regular air hand pump to move cleaner and santizer through kegs and save on CO2. I use a variation of option 2 on a conical for co2 transfer. If you use a cross instead of a tee you can throw a triclamp on the additional side or cap it off as needed for testing the guage (or fermenting in a keg). The MFL side is used with a gas line to transfer the beer in my case. That same line also can thread onto a beer gun, which is one advantage to using MFL’s. I didn’t think about it until reading this article, but I can cap that MFL off to use as a spund. The conical can’t hold the pressure like a keg can, but I can get a jump on it a save a couple days off the carbonation process by setting at 10psi or so. I’ll have to try it next time. Thank you. Nice write up. I just kegged my first beer. Is there any reason to use the female over the male flare fitting? or vice a versa. Hey Dave! – I suppose it comes down to how and where you’re going to use it. I like the “option 1” build the best. I like being able to attach this right on a keg with no tubing. It’s a neat, clean setup. Having said that I think the second option is good too. Practically speaking, they all do the same thing.